The big Fermi launch party might be scheduled for next week, but Nvidia still has its lips clamped firmly shut on all the details. A lot of the specs have so far been left to speculation, but some believable morsels of hearsay have just arrived courtesy of the tech rumour mill. Tech gossip site VR-Zone claims to have received a few more nuggets of info from anonymous sources in the industry. According to the site, the GTX 480 will have 512 stream processors, a 384-bit wide memory interface, a TDP of 295W and a US RRP of $499. Meanwhile, the GTX 470 will have a smaller count of 448 stream processors, a narrower 320-bit memory interface and a much lower TDP of 225W. According to the site, cards based on the GTX 470 will be significantly cheaper with an RRP of $349. All Nvidia has told us officially is that the first chips will be called the GeForce GTX 470 and 480, they will feature up to 512 stream processors and some of them will be able to address GDDR5 memory via a 384-bit wide memory interface. 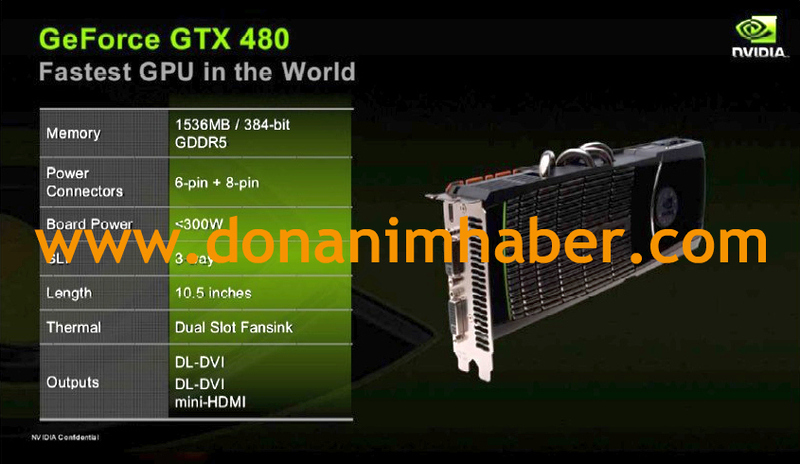 Although you should always take rumours on the Web with a fist of salt, some of these details have also been confirmed by a supposedly leaked Nvidia presentation slide on Donanimhaber, which also features what looks like an official Nvidia photo of the GTX 480 (pictured). According to the slide, the top-end GTX 480 will have 1,536MB of GDDR5 memory, and it will also support 3-way SLI. The slide also says that the card will have a length of 10.5in; the same length as cards based on AMD’s Radeon HD 5870 GPU. It looks as though the standard set of outputs will be a pair of DVI connectors, along with a mini HDMI port. The slide also says the card’s TDP will be under 300W, but if VR-Zone’s claim of 295W is true, it’s going to be drawing very near the 300W mark when it’s maxed out. Interestingly, VR-Zone’s sources apparently also confirmed that dual-GPU Fermi cards are definitely in the works. However, given the super-high TDP of the GTX 480, we’d imagine that the dual-GPU cards will be based on the 470 chips, or a new chip based on the same architecture. There’s still no word on clock speeds yet, but a picture of Fermi is gradually starting to emerge. The lid will finally be lifted on Fermi at the Penny Arcade Expo on 26 March next week.